More than 5,000 teary-eyed Brazilians marched to the site of a plane crash that killed 199 people, blaming the government for the nation's deadliest aviation disaster. Dr. Mauricio Pereira wore a T-shirt at Sunday's march with a picture of his 22-year-old daughter, Mariana, a first-year medical student who was aboard TAM airlines Flight 3054 when it sped off a runway and slammed into an air cargo building. "Corrupt and incompetent officials killed my daughter," read a banner Pereira held as he walked 10 kilometers (six miles) from a park to the crash site just outside Congonhas airport, the nation's busiest. Pereira and hundreds of other demonstrators threw flowers toward the gutted building, and shook hands and hugged firefighters who had retrieved the charred remains of the victims. The crowd then recited the Lord's Prayer in unison, sang Brazil's national anthem and demanded President Luiz Inacio Lula da Silva's ouster. The respected news weekly Veja reported over the weekend that information from the flight recorders showed one of the jet's throttles was in the accelerate position instead of idle while touching down, suggesting pilot error. Veja did not say how it obtained the information. The recorders were analyzed in the United States and brought back to Brazil last week. But many marchers said they doubted the report because it would ease pressure on Silva - known widely as Lula - whose administration came under withering criticism after the crash for failing to invest in airport infrastructure over the past five years despite a commercial travel boom. "It's the best thing for Lula that could have happened," said Gabriela Paulino, a lawyer who did not know anyone on the TAM Airbus A320 but carried a single yellow rose for the victims. "Now they're going to blame the pilot because he's dead." The plane's right reverse thruster was also deactivated when it landed, but TAM Linhas Aereas SA said that was in keeping with government-approved safety measures and that the plane was safe to fly. Brazil's air force issued a statement saying investigators have not disclosed any information about the data recorder to outside sources, and that Veja's suggestion of pilot error is just one of many being studied. The magazine said the incorrect throttle position caused the plane to speed down the runway at Congonhas airport three times faster than normal, and may have prompted the plane to veer off the runway's edge. It also said the short runway played a role in the crash because the troubled jet did not have enough room to stop. Silva last week replaced his top aviation official and vowed to improve the nation's air travel system. 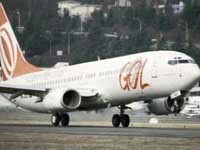 Congonhas' main 1,939-meter (6,362-foot) runway was shut down for more than a week after the July 17 accident. It reopened Friday, but TAM - Brazil's No 1. airline - has since imposed new restrictions and says it will not use the airport when it is raining. Protesters called on Brazilians to boycott commercial flights on Aug. 18, when they plan another demonstration at Congonhas.